LEURA – 24 Victoria Rd, Bellevue Hill. Built in 1891 for Mr Tom Knox, brother of Edward William Knox, adjoining ‘Rona’ and probably by the same architect. 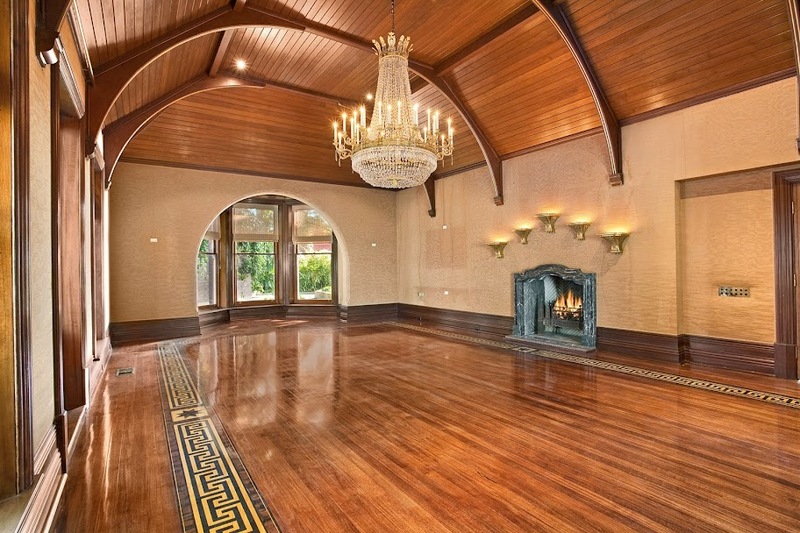 Businessman Ken Allen and wife Christina have listed one of Sydney’s finest estates, the 1891 Bellevue Hill mansion, Leura. It comes with initially cautious $30 million plus advisory. Some 29 years since last sold, the tightly held home has just had the six owners through its 125 years. Its listing is perfectly timed as leading eastern suburbs agents are complaining there’s simply not enough prestige property to satisfy the latent spring market demand. 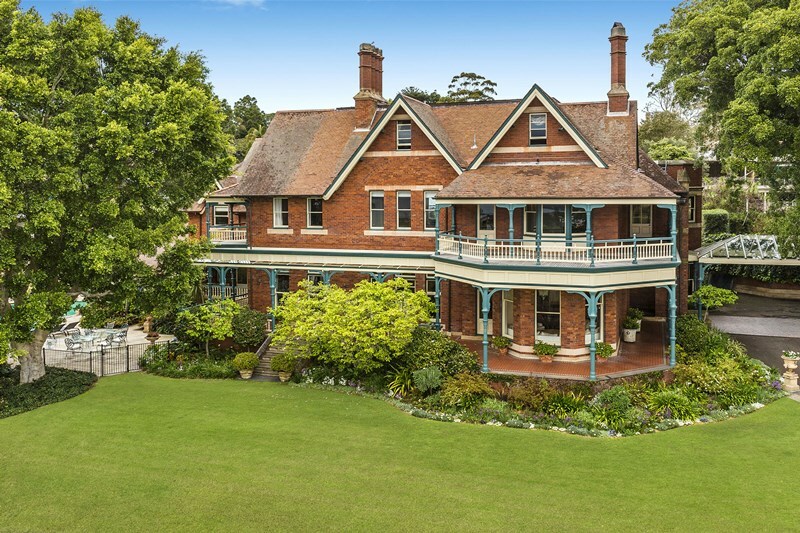 Set on 4,260 square metres Leura is a trophy home “unparalleled in grace, style and historic significance”. Even in Sydney $30 million seems a lot for a property but just the views at Leura are worth at least that! The view from ‘Leura’ located in Bellevue Hill. It was built on the Bellevue Hill ridge line for the Knox family, of the then burgeoning Colonial Sugar Refinery empire. The middle aged Tom Knox had Leura, and his older brother, Edward had nearby Rona, probably both designed by the same architect, Walter Vernon Liberty. Tom Knox, who had married into the Victorian pastoralist Ritchie family, was the managing director of Dalegty, the stock and station agency. Those pioneering Knox brothers chose the hillside panorama long before Sydney Harbour’s famous icons, partly because of the unsanitary conditions down on the water’s edge. 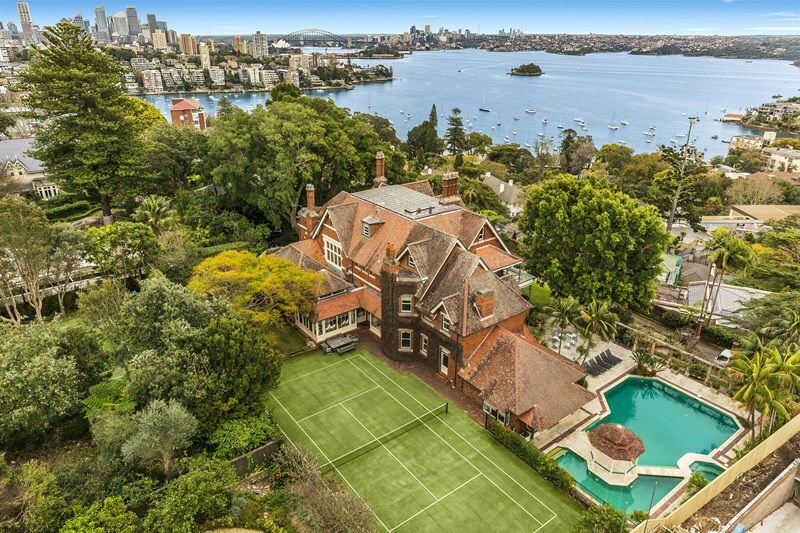 “It is a monument to the Federation Queen Anne style of architecture from the era,” Ray White Double Bay listing agent Michael Finger says. With eight bedrooms and plenty of space there is all the room a growing family could need. Finger’s Ray White colleague Di Wilson says the property was purchased in the mid-1950s by Cranbrook School for boarders. With privacy at the very end of a circular driveway off Victoria Road, the eight bedroom home combines traditional opulence and modern design. 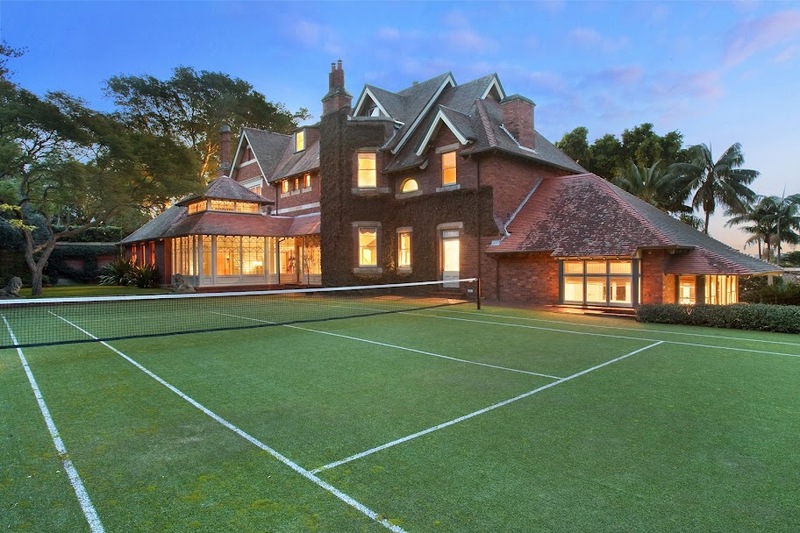 There’s a tennis court and resort swimming pool…and private level lawns overlooked by wide north facing verandahs. 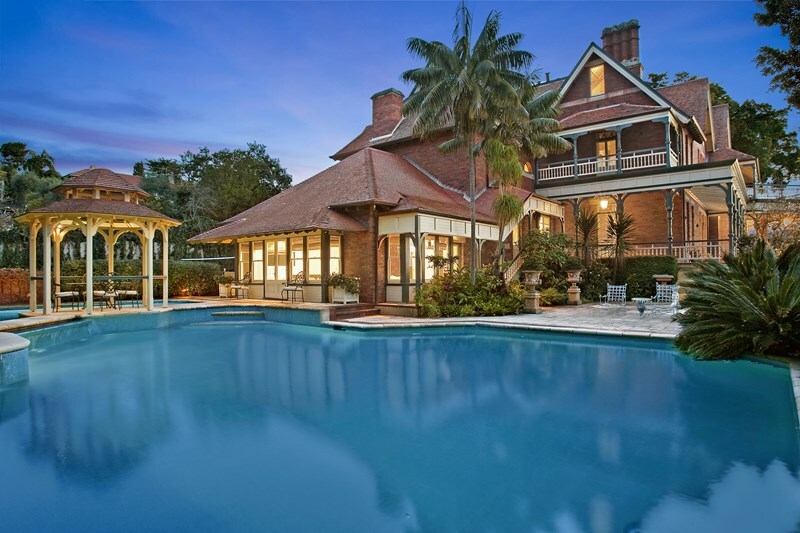 It last traded through Michael Finger in 1986 for a then very impressive $7.3 million when sold by the top end home restorer Bill Shipton, who’d engaged building designer, Roderick Learoyd, trained at the Oxford School of Architecture, to assist in its renaissance. The 1986 sale to the New Zealand businessman heralded the brief mid-1980s trend of Kiwi entrepreneurs crossing the Tasman to try their luck in Sydney, all with trophy home acquisition to boot. They included the Goodman Fielder Wattie chairman, Pat Goodman who secured another Shipton home, the 1917 Double Bay mansion, Verona. Most departed after the 1987 stockmarket crash, with Sydney not ever seeing the likes of Sir Frank Renouf, John Spencer, Rod Petricevic and Colin Reynolds again. 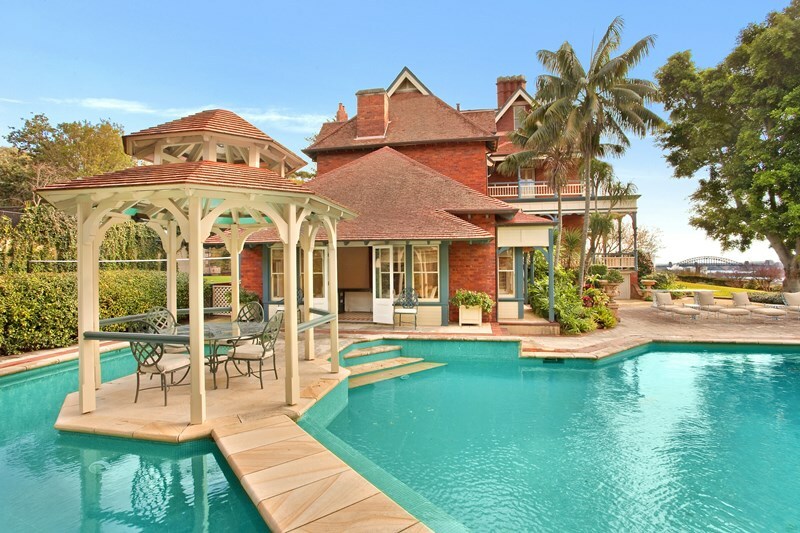 Over 4260 square meters of established grounds, resort style sanctuary (Ray White Double Bay, 2015). 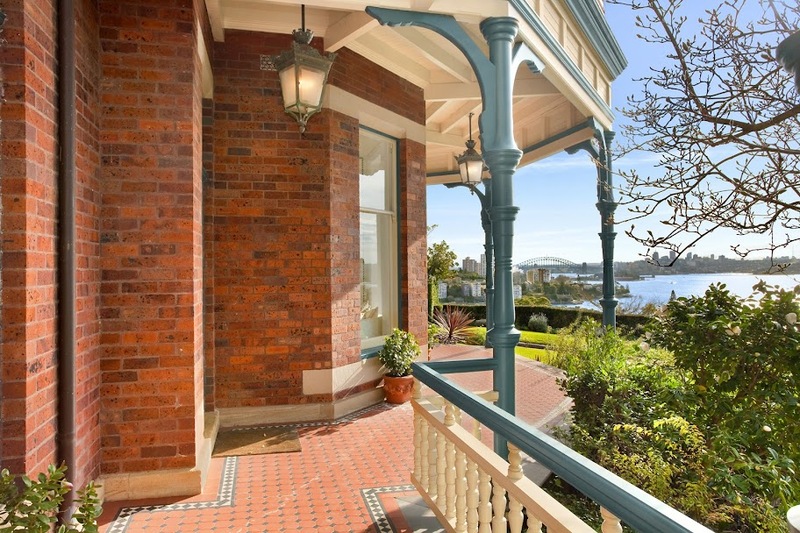 Retains its splendid setting and panoramic views of Sydney harbour; the curved drive passes below in front of the house (Boyd, unpub., 2010, 226). Site of an old Aboriginal camp and has a natural spring (NTA, 1978). A Substantial Marine Villa but in 1890, probably the last collaboration between (Walter Liberty) Vernon and (Howard) Joseland. 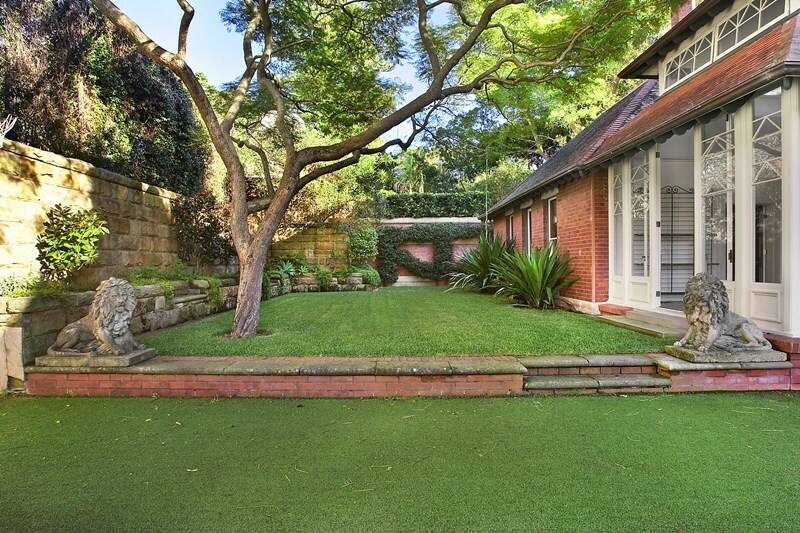 Two storey brick house retains its splendid setting and panoramic views of Sydney harbour. The characteristic Shavian planning is evident in the arrangement of the principal rooms, which overlook the harbour, around the substantial stair hall. 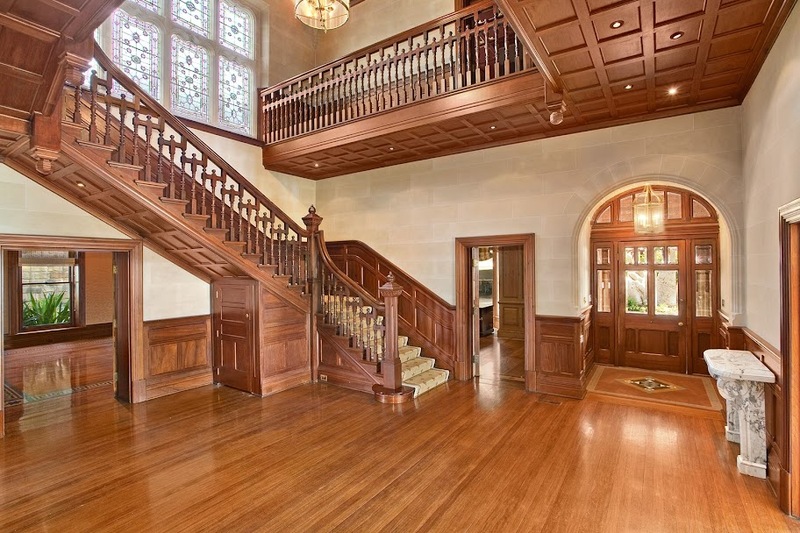 The small gable that marks the entrance and the main stair hall are Gothic Revival in character, employing restrained Gothic style tracery to the large window that lights the stairhall and to the front door. The stairhall has been altered; the ceiling and the upper rooms were unfortunately destroyed in a fire in 1909. A new roofline, with an additional gable was built. The generous two-storey vernadah employs cast iron columns, providing the necessary strength for the added height (Boyd, unpub., 2010, 226-9). Undeniably one of Sydney’s grandest estates, Leura c1891 is a landmark residence unparalleled in grace, style and historic significance. The majestic home is embraced by 4,260sqm of established grounds and is a monument to the Federation Queen Anne style of architecture from the era. Set against a breathtaking panorama over Sydney Harbour’s famous icons, the home has been intuitively crafted to create a resort-style sanctuary with a magical sense of privacy and seclusion at the very end of an exclusive circular driveway. The name given to the suburb was taken from that given to the look-out area which later became Bellevue Park – named ‘Belle Vue’ by Governor Macquarie as an alternative to the colloquial ‘Vinegar Hill’ which Macquarie considered vulgar (Woollahra Council, local history fast-facts, Bellevue Hill, accessed 7/8/2015). The area was accessed by the Old South Head Road from 1811 and the New South Head Road from the 1830s. Victoria Road was formed by the Surveyor General, Sir Thomas Mitchell’s survey of 1844 (Broomham, Bellevue Hill thematic history, in Woollahra Library, 2015, 1). The subject properties were originally part of the extensive Point Piper Estate, land accumulated by Captain John Pipe since 1816, later conveyed to the emancipist traders Cooper and Levey in 1826 following Piper experiencing financial difficulties. The estate, by then comprising 1130 acres, became the property exclusively of Daniel Cooper in 1847. After 1850 Cooper began offering some sections of his estate for sale and others as 99 year leases (ibid, 2015, 1). Edwin Tooth took up a lease of over 40 acres in Bellevue Hill in December 1854 (Broomham, R., ‘Coopers of Woollahra’, 2000, 14). Following Edwin’s death, his brother Robert Tooth built the mansion Cranbrook on the southern side of New South Head Road in 1859-60. Cranbrook was eventually sold to the founders of Cranbrook School in 1917 (ibid, 2015, 1). In c1880 Edward Knox and his brother-in-law William GIlchrist sub-leased an area of Edwin’s land in Bellevue Hill, and by the turn of the century had purchased the freehold from the Cooper family. 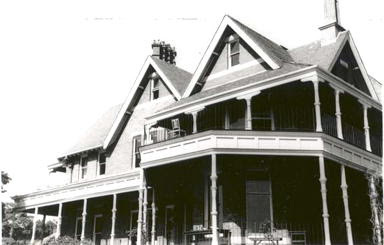 Edward built the house ‘Rona’ on his part of the land in 1883. Edward Knox and William Gilchrist made available a portion of land adjacent to Rona for Edward’s brtoehr Thomas Forster Knox (ibid, 2015, 1). Trees include a Hill’s fig on the house’s western side (Ficus microcarpa ‘Hillii’)(Stuart Read, pers.comm., 19/8/2015). Commanding position to harbour – important in visual catchment from New South Head Road as evidenced by photograph E33 (Hughes Trueman et al, 1984). Federation Queen Anne style mansion (1891) adjoining ‘Rona’ and probably by the same architect (WMC, 2015). Early Queen Anne style, leading to Federation style. Leadlight doors and window at rear. Prominent siting to Sydney Harbour. Site of an old Aboriginal camp and has a natural spring. A number of the original decorative details survive, such as the wave motif to the dado rail, the blue and white transfer tiles and the fern and sunburst detail to the grate in the dining room. The decorative motifs used are similar to the interior schemes designed by French-Australian artist Lucien Henry. Details such as panelled timber ceilings and soffits and the incised Japanese-style curves in the solid brackets to the first floro are details that appear in Vernon’s later domestic designs, the former in his own house at Wendover and in the postal chamber of the Newtown Post Office and the latter in the staff residence in the grounds of Callan Park. Further evidence that the house is largely Vernon’s work is a surviving (unpublished) tender analysis held by Woollahra Council. Completed by ‘Mr. 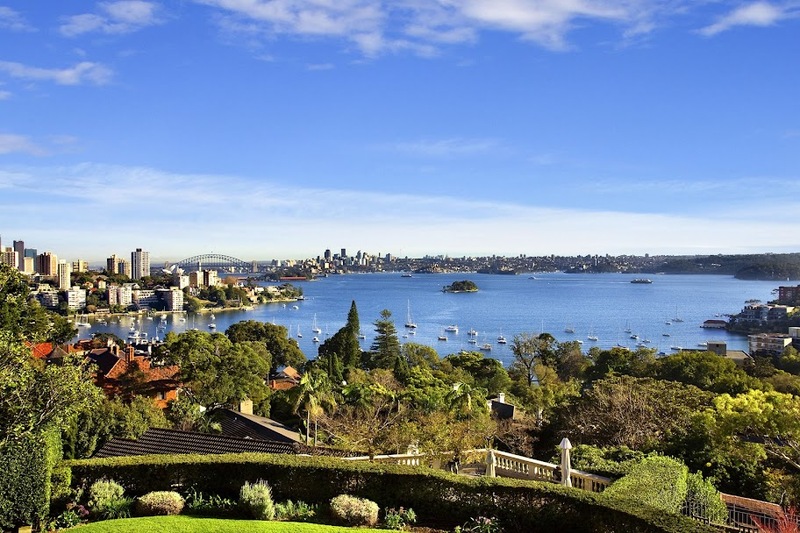 Vernon’, the list included prices from two of the builders engaged to build a number of the residences in the Neutral Bay Estate. 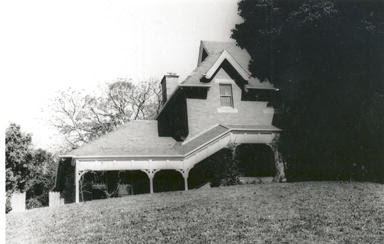 It is likely that detailed supervision of the construction of Leura was undertaken by Joseland; the houe was not completed until 1891, by which time Vernon had been appointed Government Architect. Of Vernon’s surviving work prior to this appointment, it is this design that marks the watershed between the London-influenced Queen Anne Revival and Shavian English Domestic Revival and the more restrained local variant of the style: the Federation style. It was the domestic-scale public buildings designed by Vernon and the Government Architect’s Branch in the 1890s that helped to spread the Federation style across the state, however he had already been using a similar architectural vocabulary before his appointment to the position (ibid, 2010, 229). 1909: gutted by fire in January that year, the wooden shingle roof was replaced by terracotta shingles. The billiard room on the house’s south-west is a later addition (ibid, 228). 1956 purchased by Cranbrook School to serve as ‘Street House’ for boarders. 1965 Denis Rourke architect/builder (for Cranbrook School) – fire stair added (approved 23.12.1965). CPA consultants (for B.Levy) (pool and tennis court (approved 8.4.1986). c.1985 W.J.Shipton – mechanical vent, heating (approved 25.5.1986). c.1990 K.Allen – fencing (approved 11.4.1991)(ibid, 2015, 5). It has since returned to the private sector (WMC, 2015).